Our meeting space can host up to 80 persons, perfect for business events, sales trainings, annual gatherings or much more. 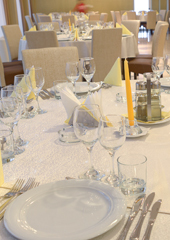 Enjoy unique moments at Hotel Mariss, either you participate to theme parties, receptions or formal meetings. These special events come with a personalized restaurant menu according to your tastes. Let us know what your culinary needs are and we’ll make sure everything is professionally looked after. Copyright @ 2014 Hotel Mariss. The photos and all contents included in this website are the property of Mariss Hotel Alba Iulia.